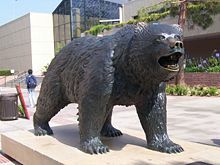 Past rosters of UCLA basketball teams have included greats such as Rafer Johnson who was the 1960 Olympic Decathlon Champion, Gail Goodrich, Kareem Abdul-Jabbar (then known as Lew Alcindor), Bill Walton, Reggie Miller and Walt Hazzard. 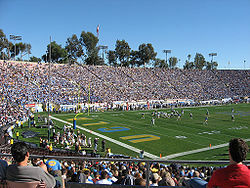 The Bruins also had a winning record for 54 consecutive seasons from the 1948���1949 season to the 2001–2002 season. 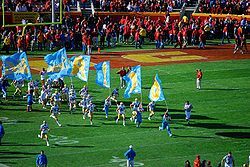 Three UCLA alumni – Frankie Hejduk, Sigi Schmid and Mike Lapper – helped the Columbus Crew to win its first-ever Major League Soccer title by defeating the New York Red Bulls 3–1 in the 2008 MLS Cup.Cobi Jones, USA's most capped national player, played for UCLA. Also, four former Bruin players, Carlos Bocanegra, Benny Feilhaber, Jonathan Bornstein and Marvell Wynne, were on the U.S. men's national team squad that defeated No. 1 ranked Spain in the 2009 FIFA Confederations Cup semi-final. 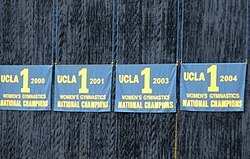 As of May 22, 2018, UCLA has won 116 NCAA team championships, second to Stanford's 117. The totals do not include any football championships at the FBS level. ^ "Division I Men's Cross Country Championships Records Book" (PDF). National Collegiate Athletic Association. Retrieved August 5, 2018. ^ "Division I Women's Cross Country Championships Records Book" (PDF). National Collegiate Athletic Association. Retrieved August 5, 2018. ^ "List of bowl games" (PDF). National Collegiate Athletic Association. Retrieved August 11, 2018. ^ "Division I Men's Soccer Championships Records Book" (PDF). National Collegiate Athletic Association. Retrieved July 22, 2018. ^ "Division I Women's Soccer Championships Records Book" (PDF). National Collegiate Athletic Association. Retrieved July 25, 2018. 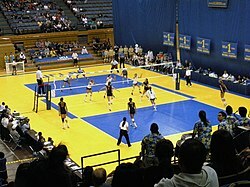 ^ "Division I Women's Volleyball Championship Records Book" (PDF). National Collegiate Athletic Association. Retrieved August 6, 2018. ^ "National Collegiate Men's Water Polo Championships Records Book" (PDF). National Collegiate Athletic Association. Retrieved August 8, 2018. ^ "NCAA Championships Statistics". National Collegiate Athletic Association. Retrieved May 23, 2018. ^ a b "Championships Summary" (PDF). National Collegiate Athletic Association. Retrieved May 20, 2018. ^ a b c d e f g h i j k l m n o p q r s t u v w x y "Division I Men's Tennis Championships Records Book" (PDF). National Collegiate Athletic Association. Retrieved July 22, 2018. ^ a b c d e f g h i j k l m n o p q r s t u v w x y z aa ab ac ad ae af ag ah ai aj ak al am an ao ap aq ar as at au av aw ax ay az ba bb bc bd be bf bg bh bi bj "Division I Men's Outdoor Track Championships Records Book" (PDF). 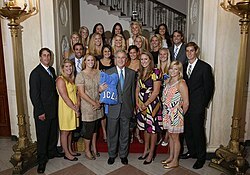 National Collegiate Athletic Association. Retrieved July 21, 2018. ^ a b c d e f g h i j k l m n o p q r s t u v w x y z aa ab "National Collegiate Men's Gymnastics Championships Records Book" (PDF). National Collegiate Athletic Association. Retrieved July 21, 2018. ^ a b c d e f g h i j k l m n o p q r s t u v w x y z aa ab ac ad ae af ag ah ai aj ak al am an ao "Division I Men's Swimming and Diving Championships Records Book" (PDF). National Collegiate Athletic Association. Retrieved July 22, 2018. ^ a b c d e f g h "Division I Men's Indoor Track Championships Records Book" (PDF). National Collegiate Athletic Association. Retrieved July 21, 2018. ^ "Division I Wrestling Championships Records Book" (PDF). National Collegiate Athletic Association. Retrieved July 22, 2018. 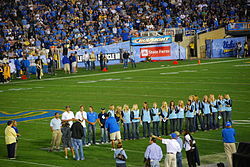 ^ a b c d e f g "Division I Women's Tennis Championships Records Book" (PDF). National Collegiate Athletic Association. Retrieved July 22, 2018. ^ a b c d e f g h i j k l m n o p q r s t u v w x y z aa ab ac ad ae af ag ah ai aj ak al am an ao ap "Division I Women's Outdoor Track Championships Records Book" (PDF). National Collegiate Athletic Association. Retrieved July 21, 2018. ^ a b c d e f g h i j k l m n o p q r s t u v w x y z aa ab ac ad ae af ag ah ai aj ak al am "National Collegiate Women's Gymnastics Championships Records Book" (PDF). National Collegiate Athletic Association. Retrieved July 21, 2018. 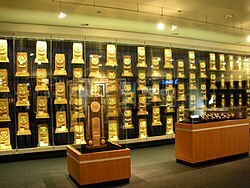 ^ a b c d e f g h i j k l m n o p q "Division I Women's Indoor Track Championship Records Book" (PDF). National Collegiate Athletic Association. Retrieved July 21, 2018. ^ "Division I Women's Swimming and Diving Championships Records Book" (PDF). National Collegiate Athletic Association. Retrieved July 22, 2018. ^ "Division I Men's Cross Country Championships Records Book" (PDF). National Collegiate Athletic Association. Retrieved July 20, 2018. ^ "Division I Men's Golf Championships Records Book" (PDF). National Collegiate Athletic Association. Retrieved July 21, 2018.